The good news is that the dangerous strain of smallpox that the author of this card was worried about was eradicated in 1977 by a vaccine. The bad news is that smallpox is viral and there isn’t a cure, as such, though you can survive the attack and go into remission. (George Washington, Abraham Lincoln, and Andrew Jackson all contracted and then survived the disease.) 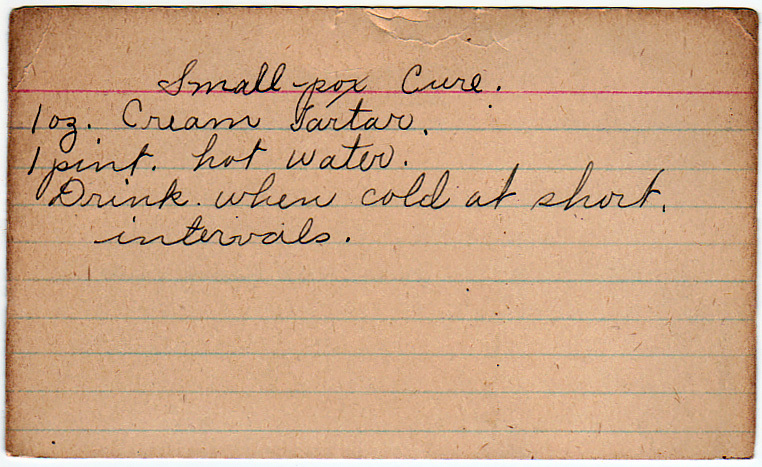 At the time this card was written in the 1920s, smallpox killed about 30% of the people who contracted it, and as many as 80% of small children. So smallpox was bad and this did nothing to help. The really bad news is that cream of tartar is about 21% potassium. In high doses, potassium can be toxic, causing an irregular heartbeat, and ultimately, death. How high does the dose have to be? Conveniently enough, we know a fair bit about how much potassium it takes to kill someone, thanks in part to our use of potassium chloride as the third portion of state-administered lethal injections (though it takes far less potassium to kill intravenously). For a 165-pound person, it would take 352.8g, or 12.6 ounces, of cream of tartar to reach an LD50 dose. For a 90-pound person, it would take 167g, or 6.75 ounces. for a 40-pound child (the average weight of a 5-year-old), it would take 3 ounces. All of these calculations assume the person hasn’t had any other potassium during the day. The recommended daily allowance of potassium for an adult is 4.7 grams. For a child, it’s 3.8 grams per day. 90 lbs. 6.75 oz. 5.9 oz. 40 lbs. 3 oz. 2.35 oz. So for small children, this cure could be worse than the disease. Drink when cold at short intervals. Yesterdish warning: Don’t do this. Number one, you don’t have the smallpox they were worried about, and number two, it wouldn’t work if you did. A universal favorite with an American addition. Or subtraction, I guess. Who the heck could even ingest 12.6 ounces of cream of tartar? This is ridiculous to the extreme.